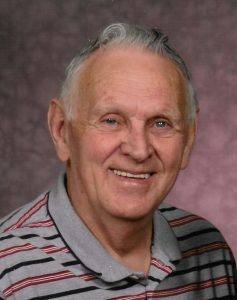 Paul Raymond Caywood was born March 23, 1934 in Neosho, Missouri and departed this life on March 23, 2019, at his home in Belton, Missouri, surrounded by the love of his family, at the age of 85 years. He was the son of Willie Ray and Martha Adeline (Ousley) Caywood. Paul spent his younger years in Neosho where he worked side by side with his father on the family farm. When Paul was 10 years old, the Army Corp of Engineers bought the family farm in Neosho and the Caywood family moved to Exeter, Missouri. At 16, Paul found a job at a tomato canning factory in Ridgley, Missouri. While employed there, he met a 16 year old women named Helen “Imogene” Packwood, who was a part-time employee of the canning factory. Paul eventually asked Imogene to marry him and worked two jobs to save enough money to buy her a ring and pay for the marriage license. On November 8, 1952, Paul and Imogene were united in marriage in Eureka Springs, Arkansas. After their marriage, Paul and Imogene lived in Exeter, Missouri until 1962, when they moved to Greenwood, Missouri to make their home and raise their daughters. Paul worked as a sheetrock finisher for Brattin Drywall for many years. After his retirement in 1996, Paul and Imogene moved back to Exeter, Missouri. Imogene preceded Paul in death on May 19, 2013. Paul continued to live in Exeter until April 10, 2015, when he moved to Belton, Missouri to be close to his daughters and their families. In addition to his wife, Imogene (Packwood) Caywood, Paul was preceded in death by his parents, Willie Ray and Martha Adeline Caywood; two brothers, Howard Caywood and Warren Garland Caywood and, one son-in-law, Roger Lynn Smith. Paul is survived by his daughters; Jeanie Smith and Robin Hunt and husband Bob all of Pleasant Hill, Missouri, and Missy Farrell and husband Jimmy of Belton, Missouri; one niece, Brenda Myer of Kansas; five grandchildren, several great-grandchildren, other relatives and many friends. The family of Paul Caywood received friends from 11:00 a.m. until 12 noon on Wednesday, March 27, 2018 at the Wallace Funeral Home in Pleasant Hill. Funeral Services were held at 12 noon with Pastor Chet Rutledge officiating. Casket Bearers were Jimmy Farrell, Roger Smith, Jacob Burch, James Farrell and Bob Hunt. Honorary Bearers were Rachel Bunce and Hali Lloyd. Interment was in the Pleasant Hill Cemetery. The family suggests contributions to the Belton Church of Christ and may be mailed to 103 Myron Ave. Belton, Missouri 64012 or may be left at the funeral home. Rest now in the arms of our Lord your mission on earth is complete. I thank you for your service to our Country and my Freedom. You will not be forgotten. and prayers to the family of …. I like to express my deepest sympathy for your loss. It was never God’s intent that death should rule over mankind. – Romans 5:12; 1Corinthians 15:26, 55; God will do away with death. But for now God has provided hope-as stated at John 5:28, 29. During this most painful time please find comfort from God’s word.